This last stage is purely a volcanic experience with a gradually increasing amount of a black sand. Marking is relatively good. There is no water in Reykjanesviti. The shortest stage of the trail is still very dry and volcanic but gets a bit busier thanks to a nearby main road. At the end of the stage it’s possible to make a detour to the famous hot pools, Blue Lagoon, or the city of Grindavík with a supermarket. There isn’t any water on the trail itself. Very vaguely marked. The fifth stage starts by crossing a colorful volcanic range. An easy grassy part is followed by an extensive mossy lava field. Only vaguely marked overall, and the initial range not marked at all(!). There are tiny streams in the grassy part but no water at the end(!). First part is forested but after the quarry it gets volcanic again. Marking is sometimes confusing, especially around the quarry. Water only at the start (a small river flowing out of the reservoir) and the end (a tiny stream going to the lake Djúpavatn). Most of the section goes through lava fields. Well marked. The only water is at the start (ask for it in one of the private lodges) and the end (river flowing from the reservoir). Rough from the start, flat and industrial in the middle with a long gradual ascent and sharp descent at the end. Some parts are vaguely marked or not at all. There isn’t any water between the Exhibition centre in Hellisheiði and the ski resort in Bláfjallaskáli. This stage is hilly with lots of waterfalls and plenty of streams to drink from. It’s very well marked but you need to know where to go since the signs don’t say ‘Reykjavegur’ but only local names (follow signs to: Dyravegur / Dyradalur, then Sleggjubeinsdalur). There is a free hut, Múlasel, at the end of the stage. Reykjavegur is a 127 km long hike along the Reykjanes peninsula, south-west Iceland. 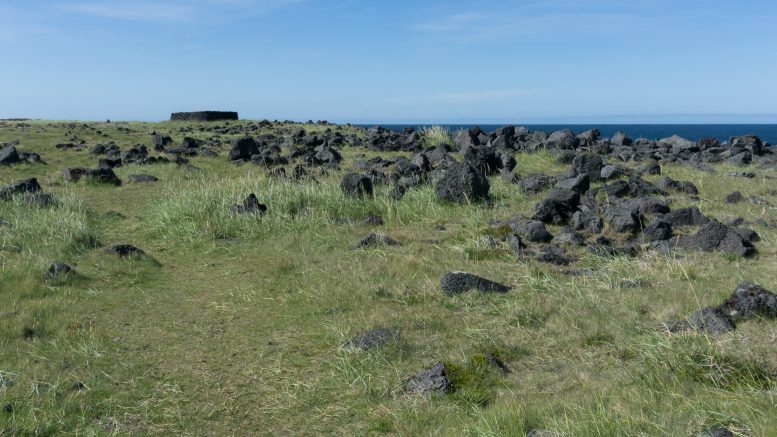 Even though Reykjavík is nearby, it attracts only a small number of hikers. We didn’t meet any throughout the 7 days and it was the beginning of August, peak hiking season.